Girls Can Tell is the third studio album by American indie rock band Spoon. It was released on February 20, 2001. The track "Me and the Bean" is a cover of a mid-1990s Austin, Texas band called The Sidehackers. The songwriter of The Sidehackers, John Clayton, played bass on Spoon's subsequent album, Kill the Moonlight. Girls Can Tell, up to December 2009, has sold slightly fewer than 100,000 copies, according to Nielsen SoundScan. The online music magazine Pitchfork placed Girls Can Tell at number 96 on its list of top 200 albums of the 2000s (decade). All tracks written by Britt Daniel except where noted. ^ a b Raftery, Brian M. (March 9, 2001). "Girls Can Tell". Entertainment Weekly. Retrieved October 5, 2015. ^ a b Christgau, Robert (March 12, 2002). "Consumer Guide: 2001 Gets Better". The Village Voice. Retrieved October 5, 2015. ^ Klein, Joshua. "Spoon: Girls Can Tell". The A.V. Club. Retrieved January 9, 2016. ^ a b Pitchfork staff (September 30, 2009). "The Top 200 Albums of the 2000s: 100–51". Pitchfork. Retrieved October 1, 2009. ^ "Reviews for Girls Can Tell by Spoon". Metacritic. Retrieved November 5, 2012. ^ Phares, Heather. "Girls Can Tell – Spoon". AllMusic. Retrieved October 5, 2015. 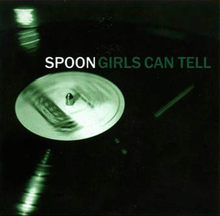 ^ "Spoon: Girls Can Tell". Alternative Press (154): 97. May 2001. ^ Mirov, Nick (February 20, 2001). "Spoon: Girls Can Tell". Pitchfork. Retrieved October 5, 2015. ^ Catucci, Nick (2004). "Spoon". In Brackett, Nathan; Hoard, Christian. The New Rolling Stone Album Guide (4th ed.). Simon & Schuster. p. 770. ISBN 0-7432-0169-8. ^ "Spoon: Girls Can Tell". Uncut (55): 118. December 2001. This page was last edited on 21 December 2018, at 10:33 (UTC).